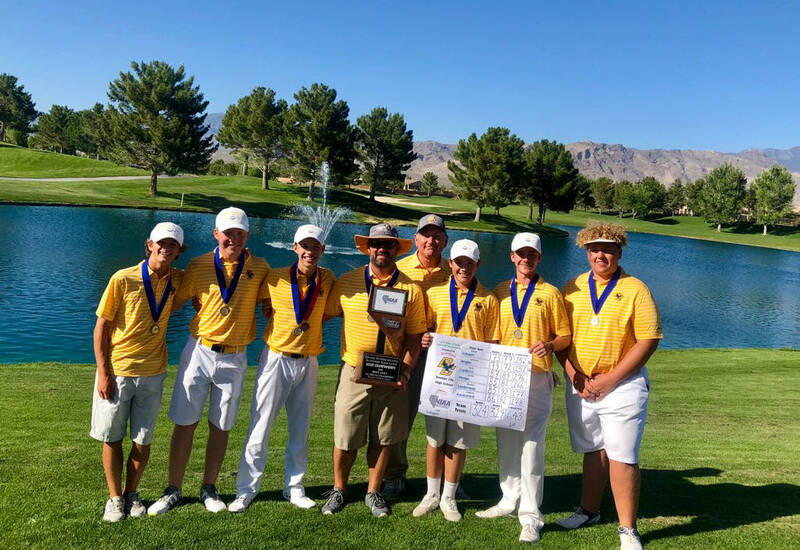 Boulder City High School claimed its first 3A state championship in 12 years after playing a perfect round of golf on day two of the tournament and earning a team score of 643. Liz Carducci Members and coaches of the Boulder City High School golf team celebrate winning their first state championship in 12 years on Tuesday, May 15. Trailing five strokes behind Northern challenger Spring Creek, the Eagles finished six strokes ahead on May 15 to redeem last season’s runner-up finish. Shooting a combined score of 319 in round two to earn their state title, senior Jackson Wright was instrumental in the Eagle’s success, finishing as the 3A individual runner-up with a score of 151. Shooting a 79 on day one, Wright improved his score on day two with a par 72. Western’s Jared Smith finished as the individual champion with a score of 142. Following shortly behind, the Eagles next star, freshman Blake Schaper placed third on the day with a score of 152, while junior Kevin Phelps placed ninth with a score of 166. Rounding out the Eagles core, freshman Kyle Carducci placed 22nd with a score of 176, while sophomore Dustin Landerman placed 25th with score of 177. Senior Andrew Kovacevich placed 28th with a score of 178. With the majority of the team returning next year, Schaper sees a bright future for his program. Having made seven consecutive 3A state meet appearances, he said to expect a few more runs out of this group.